Recordings of arias from long-forgotten Yiddish operas, street-corner ballads, cantorial hymns, and odd traditional folk songs—these lost prizes of Jewish Old World history landed sideways into a 1903 Lambert Company catalog under the description, "Attractive Hebrew Selections." The records are like an ethnographer’s dream, but listen closely and you will hear something more: the difficult assimilation experience of Jewish émigrés arriving on America’s shores at the turn of the last century. While the dandy "Up to Date Boychik" caricatured in 1904 sheet music (portrayed on the front cover) offered one path of "Americanization," an emerging Yiddish theater scene in New York, built on recognizable Eastern European traditions, offered another. Here, the great works of Abraham Goldfaden and "Professor" Moshe Hurwitz were performed to eager audiences; here, the voices of Solomon Smulewitz, Kalman Juvelier, William Nemrell, and "King of Comic Singers" Dave Franklin rang out supreme. These are the earliest known Yiddish recordings in the world, and this anthology will be the first time since their issue over a century ago that the cylinders will be heard by those able to understand their pithy and colorful language. 56-page booklet included, with notes and Yiddish-to-English translations by Peabody Award winner Henry Sapoznik. Produced in cooperation with the Mayrent Institute for Yiddish Culture and the Mills Music Library of the University of Wisconsin at Madison. 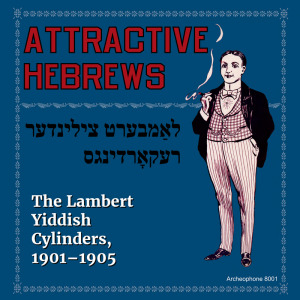 Visit Attractive Hebrews' expanded catalogue page to see the complete track listing and listen to sound samples.